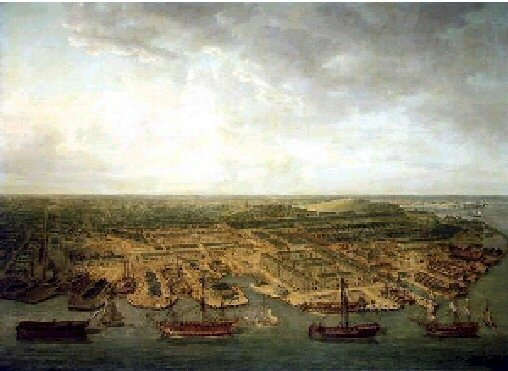 "The dockyard was built circa 1691. The location was originally called "Plymouth Dock," since it was built on the outer reaches of Plymouth, Devon. Then for a hundred years it was just called "Dock." Then in 1824 the name was changed to Devonport, when it became a borough in its own right. 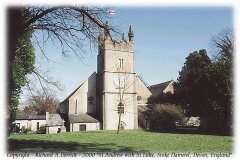 It is within the parish of Stoke Damerel. Stoke Damerel church still stands today." James Hawkins was born around 1815 in Devonport, Devon, England. James spent most of life working in the Dockyards in Devonport. However, when he marries he is listed as a Mariner. James marries Jane Robinson on 21 July 1844 in the Parish of Stoke Dammeral. Elizabeth Lozer and John Symons witness their marriage. At the time of the marriage James is living at 20 Cannon Street and his occupation is Mariner. On the marriage certificate, James' father is listed as John. John's occupation is laborer. It is believed that James was born to John Hawkins and Ann Gregory. They were married by banns in September 1815. Jane is a spinster living at 32 Queen St. There is no occupation for Jane. Her father is Alexander Robinson and his occupation is servant.2 Click to see a map and pictures of the area where both James and Jane lived. As a Mariner, James is away from home and this must be the reason that nearly six years passes before their first child, Thomas James Robinson Hawkins is born on 3 November 1850. James is 37 years old and Jane is 31 years old. They are living at 8 Cannon Street in the parish of Stoke Dameral. By law all births have to be registered within 6 weeks. James reports the birth on 11 November 1850. The mother's name is given as Jane Hawkins formerly Robinson.3 At this time James is working as a Rigger on the docks in Devonport. A rigger is a hoist tackle worker and works on a ships rigging. Typically riggers were civilain workers at navy yards. A rigger might be involved in the construction of scaffolding, temporary shelters and access ramps to vessels in dry dock. Lots of hand-signals were used from the riggers on the deck to those above. 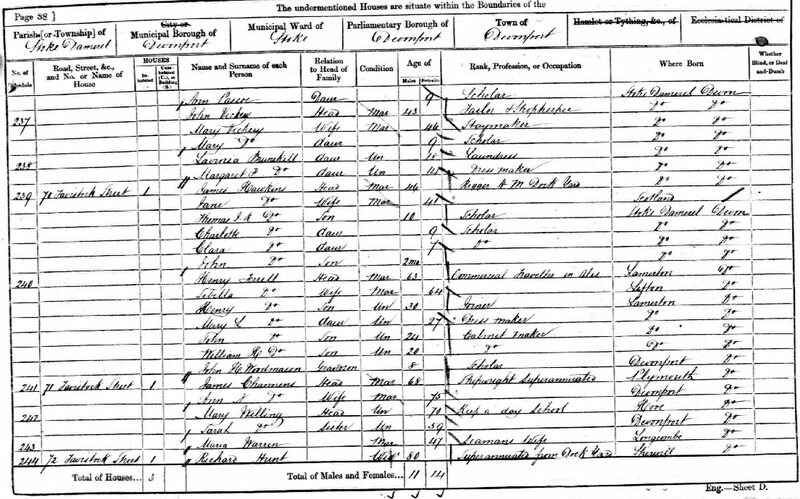 The family can seen in the 1851 Census of Stoke Dameral Parish, town of Devonport, Devon England.4 James' occupation is rigger and they have a 6 month old son, Thomas J. R.
In 1881 James & Jane are living at 50 Clowance St.11 John is the only child at home at this time.12 Thomas has gone to Australia and both Charlotte and Clara have married. John has been attending school at the Plymouth School of Art. He decides to go to St. Louis, Missouri, USA later in 1881. It is not known if this has to do with his art education. Family story has told that he came to the USA for the World's Fair. Probably because by 1883 Thomas, Charlotte and Clara have died and James and Jane are left alone in Devonport that their only living son sends for them to join him in St. Louis, Missouri. 2025 Obear in 2000 where James and Jane lived with their son, John Hawkins. The Home for the Friendless, a private home for elderly, impoverished women was founded in 1853 by Mrs. Charlotte Taylor Blow Charless as a memorial to her friend and houskeeper, Rachel Adams, who died alone and in poverty on the County Farm. Mrs. Charless was so moved by the circumstances of her death that she determined to provide a home to serve the needs of women who were alone and afflicted. She secured subscriptions for $13,000 and $20,000 in county bonds and the present site on South Broadway and Osceola Street was acquired. The building had been built for a defunct Swiss Protestant College, to which the home built a 20-room addition in 1880. Several other additions have been made principally during the 1930s. The home has grown and changed much as the city has over the years. The first infirmary was built in 1856. Today, renamed for its foundress, The Charless Home is a self care residence for women and men with a permanent staff of 78 and 135 residents. 1.Genuki: Devonport; 30 Mar 1996, B. Randell. 2. Ancestry.co.uk, Census, Britist: 1851 England, Devon, Internet Web Site, HO107/1882, Stoke Damerel, Devonport, St Paul, 30 Mar 1851, Ancestry, http://search.ancestry.com. Ancestry.co.uk. 3. 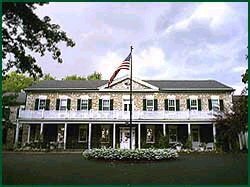 General Register Office, Stoke Dameral, Devon, England, Family Records: Hawkins, John Birth 1861, Certificate, App PAS548722/2000, 11 Nov 1850, Janice Hartman, 3367 S. Joshua Tree Lane, Gilbert, Arizona 85297. 5. General Register Office, England; Registration District of Stoke Dameral; 1852 birth in the sub-district of Clowance, in the County of Devon. 6. General Register Office, England; Registration District of Stoke Dameral; 1854 birth in the sub-district of Stoke, in the County of Devon. 7. General Register Office, England; Registration District of Stoke Dameral; 1861 birth in the sub-district of Stoke, in the County of Devon. 8. Britist Census 1861: RG 9/1450-1456; FHL Film 542815. 9. Bristish Census 1871: RO 102139-2140; FHL Film 832034. 10. British Census 1871: RG 10/2139-2139-2140; FHL Film 832034. 11. 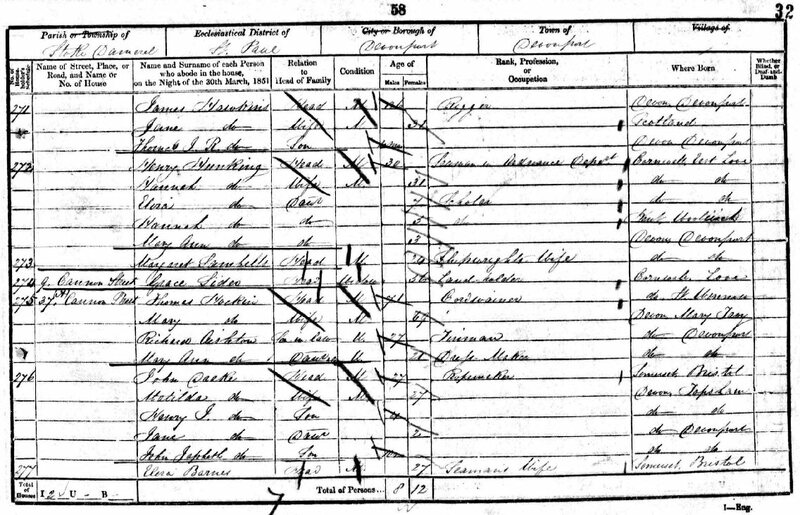 British Census 1881: FHL Film 1341528; PRO Ref RG11; Piece 2194; Folio 26; page 4. 12. "Plymouth Through the Lens Book No.3" by Moseley; http://www.ridgeway.plym.sch.uk/moseley/L3-25.html. "Clowance Street, Devonport, was one of those wonderful terraces where no two houses looked the same. In this picture the doorway on the right is that of No. 53. Stanley Street and the Clowance Tavern (No. 42) are on the left. The spire belongs to St. Stephen's. The houses were built around 1780 and even in 1942 some of them still retained their original wooden doorways and bow window. Note the differences between that at No. 49 and those at Nos. 50 and 52. W. G. Stoneman, the carrier, lived at No. 43, while the names of McLeod, Taylor, Tetley, Simpson and Leest will be readily associated with the Clowance Tavern." 13. Directory: Gould's St. Louis Directory of residents and classified business directory for the year 1883. 14. Death Records: St Louis City Death Records 1850-1908 Records, Web Site, Volume: 15 Page: 587 County Library: RDSL 24 Missouri Archive: C 10381 SLGS Rolls: 318 , http://www.ancestry.com. James Hawkins is living at 2025 Obear St. St. Louis City, Missouri. 15. 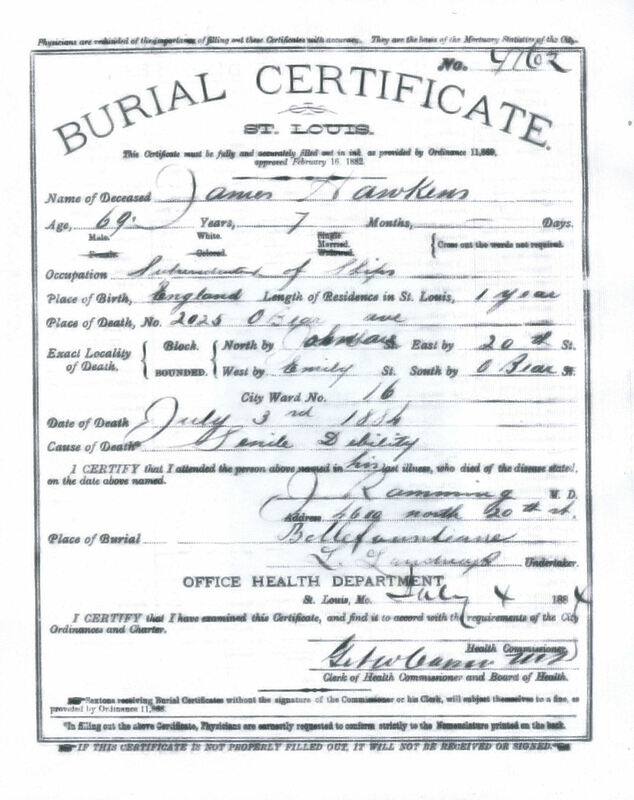 Death: City of St. Louis Bureau of Vital Statistics, Hawkins, John Death b, 1861, Certificate, Appl 081401036, Cert 556, No of Cert 5731, 6 Aug 1892. "Undertaker's Report of Death: Male, White, age 31 years 6 month, Married, Occupation Litographer, Buried Bellefontaine Cemetery, casuse of death Inanition Malnutrition on 4 Aug 1892, signed by H.W. Hermann MD, Burial Permitfiled August 6, 1892." 16. History of St. Louis Neighborhoods by Marquette-Cherokee; ; The Charless Home web page. 18. Death: City of St Louis Bureau of Vital Statistics; Application #061900013; Certificate #1221, 5006.